The Rhin-O-Tuff HD-e4100 Electric Econ-O-Roll Spiral Coil inserter is very similar to its larger brother the HD4170. With a patented gripping roller and adjustable lower roller, the HD-e4100 can be used as a stand alone coil inserter or can be used in conjunction with Rhin-O-Tuff's full line of OD and HD punches. Call 1-800-944-4573 for your best price. The Rhin-O-Tuff HD-e4100 Electric Econ-O-Roll Coil Inserter uses the unique Rhin-O-Roll gripping roller along with an adjustable lower roller for faster and more accurate coil insertion. Shown in the stand-alone configuration, it also can be mounted as a module to any vertical punch. Inserts all pitches & diameters. Optional interface kit. Can be mounted on any Rhin-O-Tuff vertical punch. Uses unique Rhin-O-Roll Gripping Roller. Adjustable Lower Roller for faster more accurate coil insertion. Economical and built with Rhin-O-Tuff reliability. Welcome to MyBinding video. This is a look at the all-new Rhin-O-Tuff Onyx HD-e4100, an electric coil inserter module. When your project is all punched, in order, and ready to bind with coil, you find yourself at the most time-consuming part of the process. That's where the e4100 comes into play. Once you've started the coil onto the bind, turn the machine on and away it goes. The extra-large rubberized inserter roller along with the smaller double roller allows for the quickest and smoothest of coil insertion. Included with the HD-e4100 is a pair of coil-crimping pliers. These are very handy in finishing your coil projects. Just keep that red dot facing up and pinch right there on the end; it not only clips the wire but pinches the end so it doesn't come out. To accommodate different sized coils, this machine is adjustable. Simply pull out this bar with its grooves and slide it onto the next size or even the largest. This coil inserter works as a standalone unit with any coil binding system or it can be used in tandem with and sit on top of any Rhin-O-Tuff Onyx punch. For more demos, reviews, and how-tos, check out MyBinding.com. Transcript: Welcome to MyBinding video. Let's check out two Rhin-O-Tuff Onyx coil inserters, the HD4170 and the HDe4100. Using an Onyx punch like the HD7700, once you punch through your project it's time to bind it with coil. And in tandem with this punch, the Onyx HD4170 can be set or mounted right on top for efficiency of space. Insert the coil, finish off your project, and your book is done, all in one neat, tidy, efficient, and great-looking work station. Welcome to MyBinding video. Let's check out two Rhin-O-Tuff Onyx coil inserters, the HD4170 and the HDe4100. Using an Onyx punch like the HD7700, once you punch through your project it's time to bind it with coil. And in tandem with this punch, the Onyx HD4170 can be set or mounted right on top for efficiency of space. Insert the coil, finish off your project, and your book is done, all in one neat, tidy, efficient, and great-looking work station. And likewise, the Onyx HDe4100 does the same thing, sets right on top. Either machine can be used as a standalone with another system or another operator. Just another example of the Rhin-O-Tuff Onyx series at work. For more demos, reviews, and how-tos, check out MyBinding.com. Welcome to MyBinding video. Let's take a look at the Onyx HD4170 and the HDE4100 coil inserters as they work with the Onyx OD4012 punch. Being efficient both in productivity as well as space-saving, the HD4170 can sit right on top of your punch. For single operators, all-in-one station is really nice. The same goes for the Onyx HDE4100. It sits atop any vertical punch made by Rhin O within the Onyx series and works like a charm. Punch, stack, bind and finish, and you're all set. All machines that are in the Onyx series are backed by a solid three-year warranty. For more demos, reviews and how-tos, check out MyBinding.com. The Rhin-O-Tuff HD-E4100 is was originally designed as an economical alternative to the tradition Rhin-O-Roll HD4170. This stripped down coil inserter includes the basic features that you will need for inserting spiral coils onto the edge of your document. The E4100 can be conveniently attached to the top of your Rhino Tuff binding punch or can be used as a standalone unit. Rhin-O-Tuff has even introduced a way to use this device with the HD4101 Ez Book former. The HDE4100 Econ-O-Roll coil inserter has a large diameter rubber roller to help guide your coil onto your documents. This large roller is made with the same high quality rubber that is used on the larger more expensive Rhino Tuff coil inserters. 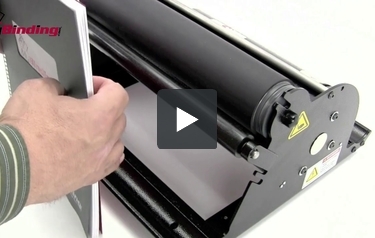 It also includes a lower roller that is adjustable to help you deal with different sized books. This lower roller is not powered by can spin with your coil as is needed. This machine has a small spine forming trough on the front of the machine. This chrome channel is used to help you add a slight curve to the base of your pages to make inserting easier for large diameter coils. This channel is designed for use with coils up to 25mm in diameter. One of the best things about the HD-E4100 is something that you won't find in print anywhere. Rhin-O-Tuff makes a special kit that allows you to attach the HD4101 EZ Book Former to the front of this machine. 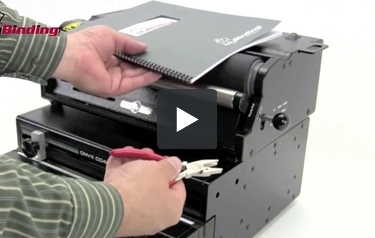 Using the two units together it is possible to load the pages of your book into the spine former and then use the E4100 to insert the large diameter coils onto your pages. Using these two units together it is possible to insert 40mm, 45mm and 50mm coils and save huge amounts of time. Using an optional kit (different from the one mentioned above) you can attach this unit to the top of your Rhino Tuff binding punch. This can help to save space in a crowded office or production area. This machine has one powered roller and another smaller roller that is not powered. The best coil inserters will have both rollers powered. With both rollers spinning the inserting process usually goes smoother and there is less slipping. Both the Rhin-O-Roll HD4170 and the GBC CC2700 have dual spinning rollers. This is one reason why this is considered an economy coil inserter. The motor for this machine is attached to the rollers using two thin clear elastic belts. These belts are much thinner than the belts used on other similar machines. If you use this machine very much it will only be a matter of time before you break a belt. The belts aren't that hard to replace. It is just a good idea to have an extra one on hand. The kit to attach the HD4101 to the front of this machine and the kit to attach this machine to the top of your Rhin-O-Tuff punch are both optional accessories that will need to be special ordered. Once you do get the kit, be prepared to spend between 30-60 minutes attaching the two units together. The instructions aren't great and I found that it was a little bit tricky when I did it for the first time. Using the HD-E4100 along with the HD4101 definitely makes inserting large diameter coils a lot easier. However, it is important to note that the design of the HD-4101 does not lend itself to use with index tabs or index allowance covers. These items stick out from the edge of the book making it virtually impossible to shape the spine of your book. Although this is an economy spiral coil inserter in some ways I prefer this to many more expensive models. 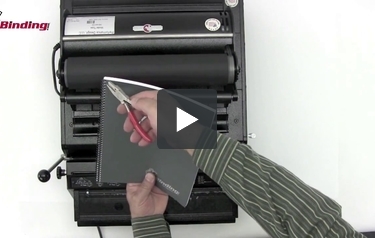 Most coil inserters have a really hard time inserting spines onto large sized books. This is one reason that they include dual spinning rollers. This machine doesn't have dual powered rollers. However, it does a fine job with small sized books. For larger sized books, using this machine when attached to a HD-4101 is much easier than using even the most expensive coil inserters. I would highly recommend this machine especially when used in conjunction with the ez book former. Just remember that it doesn't work well for index tabs. You will have to insert the coils onto those books by hand.